COLUMBIA, Mo 7/28/14 (Beat Byte) -- The family of Wal-Mart heiress Paige Laurie -- best known for a college cheating scandal that cost her naming rights to the Mizzou basketball arena -- owns most of the vacant land around the Boone County Fairgrounds, aka the Central Missouri Events Center. The Laurie family's ownership of the roughly 276 acres may explain the urgency of a six-year, $12-18 million sales tax to support the Fairgrounds known as Proposition Epic. The Proposition Epic tax would create another taxpayer-supported development "anchor". The Laurie property currently enjoys three nearby development anchors, including Alpha Hart Lewis elementary school; Norma Sutherland Smith Park; and Tom Atkins Memorial Park. Prominent Columbia developers Jeff Smith and Tom Atkins donated the two parks, Atkins calling his donation a "business deal." City and county taxpayers support the parks. Taxpayer-funded development anchors accomplish three important goals: dramatically increase the value of once-vacant farmland; lure homebuyers; and provide critical infrastructure such as streets, sewers, and sidewalks. Developers also use taxpayer-funded anchors as levers to force city annexation of county property. Annexation provides numerous city amenities. Two Columbia public schools named for Eliot and Muriel Battle and a city park anchor at least two new subdivisions around Battle High School. Plans to develop the Laurie land have been in the works for years. Boone County Commissioners in 2006 examined drawings that "showed the rolling countryside surrounding the Boone County Fairgrounds transformed into large, suburban neighborhoods with hundreds of homes." A Laurie-owned subdivision east of the Fairgrounds -- Tuscany Ridge -- is gradually selling homes and individual lots. How the Lauries -- at last count worth $4.1 billion -- ended up with the land is itself a tale of boom and bust home construction. A victim of the 2008 housing bust, Columbia builder Steve Herigon lost the property in 2010 to Premier Bank. The Lauries bought Premier Bank and its assets after it, too, failed, rolling everything into their family-owned Providence Bank. 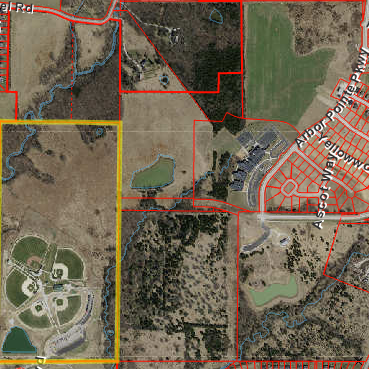 They transferred Tuscany Ridge and the Fairgrounds-area acreage to a subsidiary of Paige Sports Entertainment, North Boone County Properties, LLC. The acreage includes at least six large lots ranging from 20-50 acres each on Waco Road, Oakland Gravel Rd., and Brown Station Rd. ; and about 64 smaller lots throughout Tuscany Ridge on streets with names that remind of Italy such as Napoli, Venice, and Gondola. Only people and companies with significant political power can play the development anchor game, which a retired CoMo developer explained to this publication. First, buy cheap farmland in the boondocks, which every Boone County developer knows will be taxed at the ultra-low farmland rate until every last inch is developed. Next, use political muscle to push Columbia Public Schools into constructing a nearby school; the city of Columbia into constructing a nearby park; and now, it seems, Boone County into a $12-18 million "do-over" of the Fairgrounds. With each new taxpayer-funded anchor comes equally important taxpayer-funded infrastructure. A school in the boondocks, for instance, needs sewers, sidewalks, streets, lights, and so forth, all readily accessible to the subdivision going up next door. Pressure also mounts for Columbia to annex the land. In short order, the politically-connected developer transforms a vacant parcel worth a few thousand dollars per acre into a valuable capital asset worth tens or hundreds of thousands per acre, and with no need for market forces. Taxpayers and utility rate payers have footed the bill. If Proposition Epic passes August 5th, the next question may be: Does the Central Missouri Events Center become the Paige Laurie Events Center? Should the Boone County Fairgrounds be renamed the Paige Laurie Playgrounds?